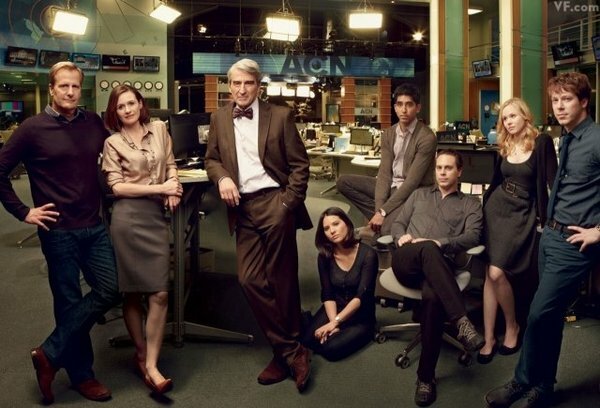 Cast of the new HBO series, The Newsroom: (from left to right) Jeff Daniels, Emily Mortimer, Sam Waterston, Olivia Munn, Dev Patel, Thomas Sadoski, Alison Pill and John Gallagher, Jr. If I can carry on the Christmas anticipation theme of my last post about this show, I am slowly coming down from the post-unwrapping 'high' that I got late Sunday evening after watching the debut episode of HBO's newest drama series, The Newsroom. Estimates put the number of people who caught the premiere on the television outlet (and through various other online places like HBO.com and YouTube) at a respectable 3 million total. Reviews have been mixed to negative by media critics, many posted before the show actually aired, with most of the criticism focused on series creator Aaron Sorkin, his 'brand' of drama, and his general unfamiliarity with the news industry. Sorkin readily pleads guilty to the last one while the others are subjectively related to how familiar the reviewer is with his work. I will admit to the world that I am not a professional television critic but I do want to mention here what I liked, what I didn't, and my overall impressions of the show so far from the perspective of a regular (although perhaps biased) viewer. As a new subscriber to HBO, the first thing that caught my attention was the language, specifically the use of profanity. Not subject to decency restrictions placed on over-the-air broadcasters, programs airing on this and other pay channels are allowed to use whatever wording they choose to convey the emotion and/or situation seen on the screen. Let me say that I am not a prude and that I have been known to 'season' my own comments with similarly 'salty' language from time to time (20+ years in the military can do that to you). On those rare occasions, I normally just let those words out in a totally unscripted manner due to a reaction to an event or to bad news or--most likely--directed at some moron motorist who happens to be sharing the road with me that day. When I have the chance to collect my thoughts, I can come up with alternatives that are just as emotive as the vulgarities but without the 'taboo' associated with dropping the 'F bomb' in a public setting (although that sensitivity is rapidly decreasing in modern society). For example, in Will McAvoy's (Jeff Daniels) response to a student's question at the opening of the show, he could've substituted some other more acceptable epithet than the "f, dash, dash, dash" word in its two utterances that would've retained its overall impact yet kept it clean for more sensitive viewers. Perhaps Sorkin put them in there to foreshadow the character's off-air personality (his public one is tightly controlled to ensure the non-alienation of any demographic, hence the nickname "the Jay Leno of news anchors") or to indicate that the outburst was highly unusual or related to a highly stressful situation (he was sitting between two constantly arguing, diametrically opposed pundits and he also thought that he saw a former romantic interest in the audience) that he later blamed on vertigo medication. The reason why I bring this up is that we have a ready example of what Sorkin can do within the constraints of decorum when you watch the first four seasons of The West Wing. He wrote 85 of the first 88 screenplays for a series that garnered nine Emmy awards for its first season as well as honors from the Hollywood Foreign Press Association, the Screen Actors Guild and the National Association of Broadcasters. While addressing issues in the Bartlett White House that, in real life, would probably elicit a few utterances of "the queen mother of all dirty words", Sorkin used his wit and a broad vocabulary to represent those emotions in a similar (and more tasteful) manner. Maybe I'm just old-fashioned but if you want to offer me an intelligent program, then don't cheat me by dropping in 'potty' words just because you can (this isn't Veep--a show that I have grown fond of but don't hold to the same standard as I expect from The Newsroom). I've said enough about the quality of the script so let me now address its quantity. I was ill-prepared for the deluge of words that would be unleashed (and the amount of mental processing they would require) in the 75-minute program and I had to enable the closed-captioning on my television in order to keep up with the intricacies and storyline being laid out in this initial episode. The show's website does provide rudimentary character biographies but you only get to really know them when Sorkin trickles out portions of their lives in his trademark dialog patterns. In one such chat, we see McAvoy and his boss, ACN news division president Charlie Skinner (Sam Waterston), carry on a two-minute conversation that starts in Skinner's office and continues through the ACN hallways between that location and a meeting room where McAvoy's former team members are gathered in a conference room to prepare his former understudy for a new 10PM program. In that short period of time, we learned several things about the characters (Skinner is a Vietnam War-era journalist who likes to drink, McAvoy is an arrogant jerk), where the anchor was during his three-week absence (a medically ordered sabbatical to St. Lucia), and the status of his show upon his return (most of his staff jumped to the new program in the wake of the 'tirade'). In another 120-or-so second spot, we glean some of the past shared by McAvoy and his new executive producer, MacKenzie McHale (Emily Mortimer) in a discussion while he waits for an elevator after their first show together (and we also find out that McHale was the woman in the audience at the college when the anchor had his 'meltdown'). I'm glad that this first episode is online in its entirety to allow me to review it and help me increase my intake 'pace' to a rate where, hopefully, I can turn the captioning off by time the fourth program airs. I do have some issues with the cast and their onscreen personas and, unfortunately, the first revolves around the choice of Daniels to be the show's lead. While he has had many laudable roles in his past, the one that keeps coming to mind is that of Harry Dunne and the infamous bathroom scene from the 1994 movie, Dumb and Dumber. Seen as a departure from the types of dramatic roles he took before that one, it proved to be one of his most commercially successful and there are on-going discussions about filming a sequel (co-star Jim Carrey recently backed out due to production frustrations). By tradition, anchors are supposed to possess a certain level of gravitas that is exhibited for the viewers to evaluate and to decide their presenter from among the available choices (the same holds true for US presidential candidates with the voters) and the Dunne role, pardon the pun, 'voids' that with me. CBS News greats Edward R. Murrow and Walter Cronkite (more on them later) were probably the two who most epitomized this trait that combines both internal (integrity, confidence, self-esteem) and external (tone/inflection of voice, facial features, mannerisms, wardrobe) to project an aura of authority and believability to their audiences. No matter how hard Daniels tries, I will probably always wonder if he has both feet on the floor behind his anchor desk or if they are raised up due to a Turbo Lax-induced bowel movement. If you think I'm picking on him, just ask Tobey Maguire (Spiderman 3) and Elijah Wood (all of the Lord of the Rings movies) about the hazards of past roles on (any) current--or future--offerings they, or their agents, might be entertaining. The rest of my criticisms might be on the 'nitpicky' side but I need to get them off of my chest. What's with all of the Scottish names? McAvoy? McKenzie McHale? McCallister (that was the anchor's original last name before it was changed)? With the sole exception of Will's blogger, Neal Sampat (Dev Patel), who is mistakenly (and stereotypically) identified by McAvoy as "the IT guy", all of the major roles are filled by white actors/actresses (with another, Atlantis World Media CEO Leona Lansing, played by Jane Fonda, waiting to be introduced in future episodes). If McHale (who, I am assuming, to be a woman in the 35-45 year age range) is supposed to be "exhausted" and one of the best executive producers in the business, shouldn't she look like a woman who would meet those real-world qualifiers instead of someone who just walked out of a salon? Even when she's totally submersed into a completely unscripted live program about a rapidly unraveling event after a 3-year absence, there doesn't seem to be a hair out of place or a crow's foot to be exposed which dishonestly displays how someone would actually appear in that situation. Why go for realism with the 'gutter' dialog our ears are unfortunately exposed to but 'airbrush' it out of the visuals so as not to offend our eyes? Or aren't American television viewers ready to see a real mature professional woman on their screens in the second decade of the 21st century? Enough with the negatives...I really liked the opening credits theme music and the montage of journalism greats (Murrow, Cronkite, Dan Rather, Chet Huntley, Don Hewitt and others I didn't recognize) interspersed with the characters of the show. While it doesn't have the 'pomp and circumstance' vibe that was conveyed in The West Wing's presidential-inspired composition, Thomas Newman's piece seems to fit nicely into a series that relies upon remembering how the way news used to be done in order to navigate its way to a (hopefully) better future state. As a child during our country's "Space Race" of the 1960s, the Sputnik fly-by instantly resonated with me and reminded me (and perhaps other viewers out there as well) of what constitutes a truly historical event, not the ones that we are currently told, through countless hours of 'news' programming, fall into that category. 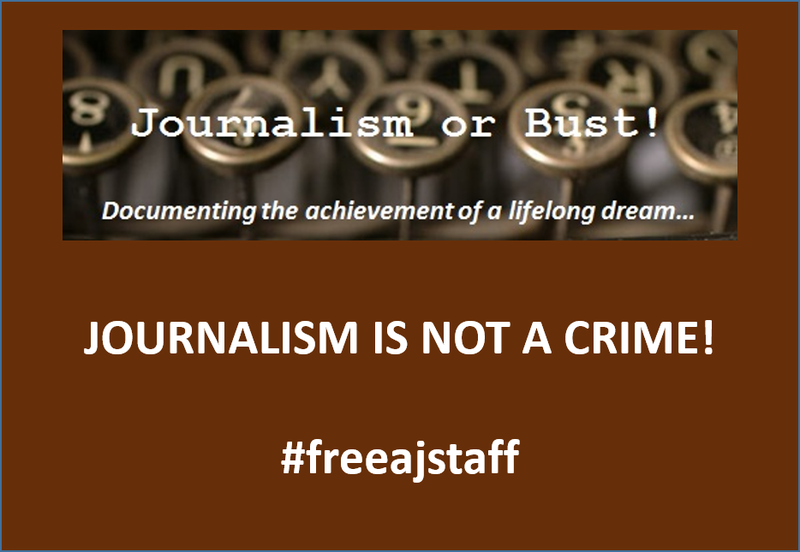 Having three 'generations' of journalists in the main cast provides an interesting mechanism of introspection into that profession. Skinner, as the 'gray beard' newsman, is the person behind bringing McHale back to television because he "wanted to watch the news at night" and wants to remake the 'graying beard' McAvoy in the mold of yesteryear's news icons. Harper, the 27-year old senior producer, represents the up-and-coming well-'wired' generation that will push the higher layers up and/or out and that still sees journalism in its purist forms (and before being fitted with corporate 'blinders' to focus on what is profitable instead of what is purposeful in maintaining a democratic society). I can see similarities in my own past, current, and (hopefully) future professional lives. 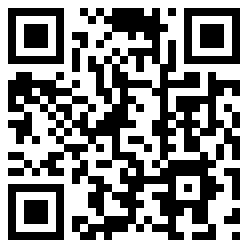 My first exposure to the intelligence field was with the transcription of Morse code, a skill that has shared the same fate as the dinosaurs' demise in today's smorgasbord of interpersonal communications options. In my new professional focus, I deal with information that didn't even exist just a decade ago but has proven its worth over and over again in the prosecution of our current operations in remote corners of the world. Although relying upon a lifetime of exposure to news and media outlets, my journalism studies require me to learn the basics and to venture forward using the prism of 'the five W's' to seek out the truth no matter wherever it might lie. I like that the show takes place in the recent past (the premiere was set in April 2010, coinciding with the actual BP oil spill that was the subject of the show) and the use of such settings has both advantages and disadvantages to the overall viewing experience. On the positive, the events can be discussed with a certain level of confidence in how they actually turned out and the real players (companies, personalities, and countries) can be mentioned without trying to figure out who they are actually talking about. 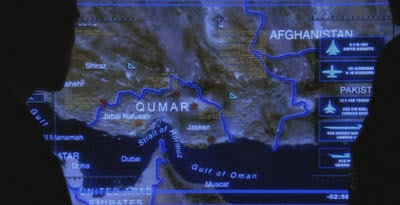 For example, The West Wing's use of the fictional land of Qumar as America's terrorism nemesis always had me scratching my head as to whom they were really supposed to be (a map in one of the programs, shown above, had it located along the Persian Gulf within Iran's current territorial borders). 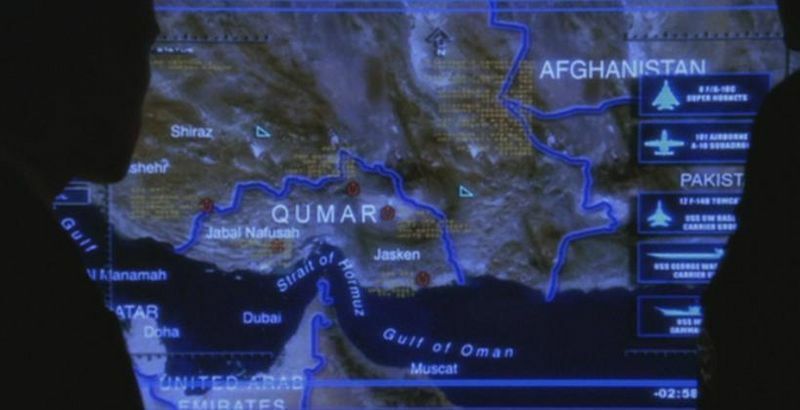 I'm guessing that real-world political sensitivities were respected in not calling out the Islamic Republic of Iran in this television setting but anything short of Atlantis rising from the deep would create credibility problems with viewers who actually know geography. Being able to say Deepwater Horizon and Halliburton instead of made-up names substituted for those actual things or organizations eliminates the need for similarly concocted back stories. One potential pitfall of gleaning story material from headlines of not so long ago was touched upon in this premiere episode. In the wake of the breaking news about the oil platform explosion and fire, the newly hired Harper happened to have two very conveniently placed sources in both of the affected corporations that were feeding him information on spillage that seemed unbelievable--and highly suspect--to his new team (the duplicitous exploits of James O'Keefe and the late Andrew Breitbart were mentioned in their discussions). He was eventually forced to identify these people to the inquiring McAvoy and Skinner (they turned out to be a former college roommate and his own sister) and if you were trying to calculate the probability of such an event happening in real life, you would probably tax even the most powerful supercomputer to its number-crunching limits. I am hoping that we will get see an honest portrayal of how reporters and news people do their jobs in the upcoming episodes instead of the deus ex machina-like method we witnessed last week. Episode #2 rolls out tomorrow night and it promises to shed more light on the past relationship between McAvoy and McHale as well as introduce a new character, Sloan Sabbith (played by Olivia Munn), ACN's financial news reporter. We are also supposed to get our first glimpse at the 'back-to-the-future' structure that McHale wants to bring to the show (dubbed 'News Night 2.0') and I'm hoping that it will conform to Sorkin's goal of pitching solutions for the crisis that currently ails American journalism in general and television news specifically. After one episode, I am a guaranteed weekly viewer and I am hoping that others will give The Newsroom a second (and third) chance in the weeks to come so I can have others to talk to about the shows instead of posting my opinions online.